Spoiler alerts do not apply here because, wait? Really? There are actual human beings who have not seen Francis Ford Coppola‘s The Godfather? Surely they have heard the Nino Roto soundtrack? It’s true. According to a British video rental service LOVEFILM back in 2011 (do video rental services still exist?) The Godfather is the number one movie people lie about having seen. As many as four out of five! Shocking, I know. Because the reason there are no spoiler alerts is that The Godfather is one of those films you see over and over again, to the point of being able to recite nearly every line. Or is that just me? The first movie is based on the bestselling book by Mario Puzo, published in 1969. While the story is about a fictitious New York crime family, whose patriarch, Don Vito Corleone (Marlon Brando), is one of the heads of the Five Families, there are some references that mirror real life mobsters. For example, the character Johnny Fontane (Al Martino) resembles Frank Sinatra. There are similarities between real life crime scenes and those seen in the move, particularly during the baptism. 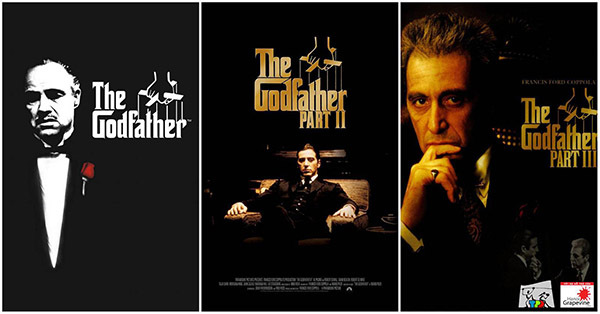 While the first movie references Vito Corleone and his power in the mafia, the second movie, The Godfather: Part II, dives into the rein of Michael Corleone (Al Pacino) and the background of his father Vito Corleone (Robert De Niro). As it turns out, Michael is more ruthless than his father to the point that he doesn’t not balk at killing his own brother Fredo (John Cazale). Find Hot New Movies & TV Releases Available This Week from Vudu! The Godfather: Part III fast forwards many years later when Michael Corleone and Kay Adams Michelson’s (Diane Keaton) children are grown. It is about Michael trying to legitimize the family business and make up for his sins of the past. At the same time, he councils and trains his nephew (Andy Garcia) to potentially take over the family business. Pre-order Assassin’s Creed Syndicate and Receive a GameStop Exclusive Assassins Creed Necklace. I can’t even believe I’m saying this, but if you have not seen these movies, especially I and II, go to the link at the top and order them. Then make a huge pot of popcorn, grab something to drink, and dig in and binge for a few hours. You will thank me later. I rate Godfather I and II five stars out of five (or six stars out of five) and Godfather III four stars out of five. This entry was posted in Al Pacino, Drama, Frances Ford Coppola, mafia, movie review, movies, Robert De Niro and tagged Al Pacino, Andy Garcia, cosa nostra, crime drama, debbie elicksen, Diane Keaton, Francis f, Francis Ford Coppola, gangster, Godfather II, Godfather III, jennifer miller-bender, mafia, mafia movies, Mario Puzo, Marlon Brando, mob, mob movies, movie review, movies, our movie talk, syndicate, The Godfather, The Godfather Trilogy by admin. Bookmark the permalink. Copyright © 2019 Our Movie Talk All Rights Reserved.